SITUATION: In early 2017, Emerald Expositions, the owner of Outdoor Retailer, faced pressure to move the largest outdoor trade show out of Salt Lake City, where it had been for 22 years because of discontent from the show’s customers about the public land management policies in the state. This call for action happened while balancing an RFP from cities that wished to host the show in the future, an initiative to go public and a pending acquisition of SIA’s Snow Show. OR leaned on CGPR for strategy, messaging and guidance. CGPR also lead communication planning around the new format of the combined show taking place in Denver January 25-28 in Denver. TACTICS: CGPR, using its crisis management and government relations experience, developed a clear strategy to develop what became an ongoing perfect storm of issues condensed into a 7- month period. Some likened this to standing in front of a tennis ball machine. Key issues involved those directly related to the trade show with exhibitors pulling out of the trade show, the larger political landscape involving the President, the Governor of Utah, Senators representing Utah, as well as a very active and grassroots movement, and, lastly, announcing the final decision to relocate the show to Denver for January 2018. CGPR developed key message points, prepared Q&As about show move and the acquisition while balancing environmental and nonprofit partner concerns with business priorities. The team helped drive a press conference in Denver with the Governor and Mayor announcing the move. 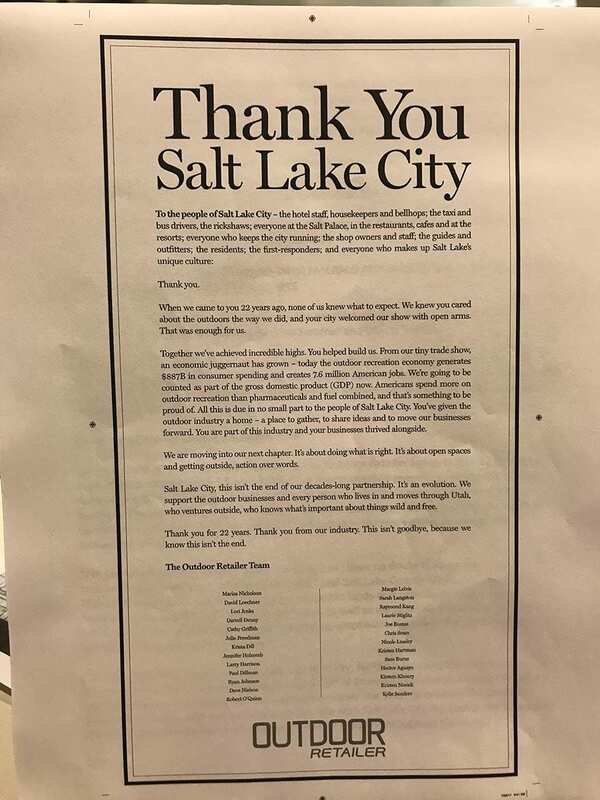 In addition, CGPR supported city officials’ relations with Salt Lake City and Denver, kept all stakeholders informed through newsletters and announcements, and developed a crisis communication plan surrounding the summer’s Public Lands March in Salt Lake City. RESULTS: The result was clear, consistent messaging across stakeholders during the location transition and conclusion of the RFP. Media took notice and following the well-attended press conference, national media, including the New York Times, featured the tradeshow move in a positive light.